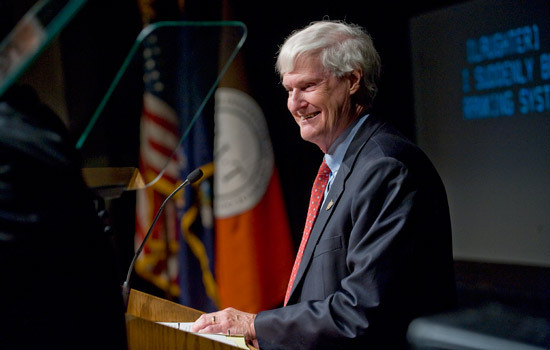 RIT President Bill Destler delivers his “Address to the Community” on Aug. 31. First of all, welcome back! It’s hard to believe that Rebecca and I are now in our fourth year at RIT, but the time has flown and it has been a privilege to work with all of you to move this remarkable university forward. This past year has been one of the most important in the history of RIT, so let’s look back a bit and congratulate ourselves on what we collectively accomplished. But first, take a big breath. After a year’s open and thorough discussion among faculty, staff and students, we made the decision to move to a semester-based academic calendar starting in the Fall of 2013. Under the direction of Provost Haefner, we have moved quickly and efficiently to implement this change and we are on schedule to submit revised semester curricula for all of our programs to the state for approval a year from now. Making this change was neither an easy nor an obvious decision, and I respect those of you within the RIT family who expressed your concern and who are now working with us to make this transition. I am particularly grateful for the commitment all of you have made to implementing this change in a way that preserves the best parts of an RIT educational experience and also increases educational opportunities for our students. Also on the academic side, we implemented a University Studies Program for students who are undecided as to major and to help those who wish to change majors, and we completed a telephone survey of those students who left RIT in good academic standing to determine their reasons for leaving. As a result of these initiatives and many others that we have introduced over the past few years to improve student retention and graduation rates, we are finally beginning to see progress in this all-important area. In fact, 91.3 percent of all freshmen entering in Fall 2009 are registered for the Fall 2010 quarter (a record high), and the five-year graduation rate for the latest cohort has increased to 68.3 percent, indicating that the usual six-year graduation rate for this cohort will exceed 70 percent (also a record high). We implemented new policies on faculty promotion and tenure, initiated a new master’s in architecture program, and we initiated a new master’s in sustainable systems degree program to augment our sustainability Ph.D. program. Enrollment at our RIT campuses abroad has increased to 1,200, and our fledgling Dubai campus has received a new $5 million commitment from the UAE to support the introduction of undergraduate programs there. The group working on the RIT/RGHS Alliance has completed a strategic planning process calling for a Joint Institute of Health Science Research, Education and Outreach to be administered by RIT. Included in the Joint Institute will be an RIT School of Health Sciences which will allow us to coalesce our various educational programs in the health sciences area and permit the introduction of carefully selected new educational programs in this area as well. On the administrative side of the campus, we hired Kevin McDonald (formally vice president of diversity and inclusion at Virginia Tech) as chief diversity officer, promoted Sophia Maggelakis to the position of dean of science, promoted Mary Beth Cooper to the position of senior vice president, and we appointed James DeCaro as interim president of NTID and initiated a search for a permanent occupant of this important position. Speaking of NTID, under Jim’s leadership, faculty, staff, and students at NTID completed an ambitious strategic planning process last year that should provide significant input to the next president on future directions for this most unique element of RIT. In the area of Student Affairs, we cheered our men’s hockey team through a record-breaking season that resulted in both the Atlantic Hockey regular season and Tournament championships, our first appearance in the NCAA Division I national championship tournament resulting in the championship of the East Region Tournament in Albany, and our first appearance in the NCAA Division I Frozen Four. Not to be outdone, our men’s lacrosse team won the Empire Eight Championship and advanced to the second round of the NCAA tournament. In addition, we held the first “Freeze Fest” winter carnival at RIT and we opened a new campus center which provides greatly improved support for our student government, clubs and other activities. Our enrollment management division met both Fall 2009 and Fall 2010 application and enrollment targets and our fall entering freshman class is both more selective and more diverse than previous classes. Our Community and Government Relations Division helped to secure $2.35 million in federal support for three different research projects and, in the most difficult possible circumstances, secured $10 million in state funding for a new facility for the Golisano Institute for Sustainability at RIT. In the area of research, we received over $54 million in new contract and grant awards, and 263 faculty submitted 675 proposals for research funding to external agencies this past year, both numbers exceeding both targets and prior year numbers. Our unique Corporate R&D Program is also growing, and currently involves 18 faculty and 32 students, and has generated more than $250,000 in intellectual property fees. Attempts to raise private funds from friends, alumni, foundations, and corporations have been hampered by the continuing economic recession, but we did manage to raise a total of $21 million in new gifts to RIT over the past year, highlighted by a new commitment of $5 million from a trustee as a challenge grant to encourage other friends and alumni to support RIT. This wonderful gift will be formally announced soon. Progress on new and renovated facilities has included the completion of the Student Innovation Center/Administrative Services Building complex $1 million under budget and the achievement of a LEED Platinum rating for the complex, one of only 49 such buildings worldwide. As a result of this and numerous other efforts to make RIT a model of best sustainability practices in our operations and our research and education programs, RIT was named a “Sustainability Campus Leader” by the Foundation for Sustainable Endowments, an organization that gave us a “D” rating only two years ago. In addition, the Sierra Club recently named RIT as one of the top 100 “greenest” campuses. I would especially like to acknowledge the efforts of a friend of mine, Dr. Rebecca Johnson, for her continuing efforts to push all of us toward a more sustainable future. This Fall we will initiate a search for a campus sustainability coordinator to ensure that we continue to be seen as a leader in this important area. The Sands Family Studios, a new facility for the School for American Crafts, was opened last Fall and the adjoining Vignelli Design Center was also completed this Summer. The Campus Center, a model of adaptive reuse of the previous Woodward Pool facility, was also completed and occupied last year, and the huge Global Village project is virtually complete as I speak today. You will notice new bike paths and work on a new pedestrian mall on the south side of campus, and we are currently completing an exterior renovation of Orange Hall, formerly known as Building 13, to make it more compatible with the surrounding architecture. Looking ahead, Institute Hall, a new facility to support bioengineering and chemical engineering and to provide badly needed research and instructional space, is currently in the design phase with construction slated to start this fall, and a new facility for the Golisano Institute for Sustainability is also currently in the design phase. Our third Imagine RIT Festival was the best yet, with over 32,000 visitors drawn to campus to witness the incredible creative and innovative work of our faculty, staff and students. And, perhaps more importantly, 80 percent of the exhibits, performances and demonstrations were new, an indication of the strong ongoing creative energy at work here. Looking ahead to the next year, we will be working in all of these areas to continue the impressive upward trajectory of RIT nationally and internationally. This year we will finally have in place a full set of educational and administrative assets to support innovation and entrepreneurship on campus, including the student innovation center, an associated design and prototyping facility, an entrepreneur’s house, our business development laboratory, our intellectual property management office and our business incubator. My hope is that this year we will finally organize ourselves to fully utilize these assets to build a reputation for RIT as the place to come if you have innovative and creative ideas with the potential to yield new products, services and businesses. In this way, we can become a real economic engine regionally and nationally. And we will have to continue to work on the calendar conversion process, on setting up the Institute for Health Sciences and the School of Health Sciences, and on continuing our efforts to build a model diverse community at RIT. Consistent with the latter goal, we will welcome our first class of RIT Rochester City Scholars, and we will need to work to ensure their success as well as that of all of our other students. RIT remains a too-well-kept secret, however, and we have engaged a branding firm, based in Philadelphia, to assist us in telling RIT’s amazing story to the world. Over the next year, with your input, we will roll out a refined brand message first internally, and then externally. Please help us refine this message by providing feedback as requested throughout the year. Finally, this year we will launch several mini-fundraising campaigns aimed at specific RIT goals and objectives, including a mini-campaign to increase alumni giving and engagement. While the launch of a major institutional fundraising campaign during the current economic recession would probably not be a good idea, these mini-campaigns can prepare the way for a comprehensive campaign to be launched in the next few years. For all of this I can only say thanks. I know that this progress was achieved because RIT is more than just a job to all of you. You have put your collective hearts and souls into this place in a way that compensation alone cannot produce. Working together, we are on one of the most positive tracks in all of higher education. Here’s to another great year for RIT! Thanks again for your support.